Louisiana Governor Bobby Jindal today said President George W. Bush “absolutely made the right decision” to invade Iraq. The issue made headlines this week after former Florida Governor Jeb Bush was asked about his brother’s decision. During a taping of Iowa Public Television’s “Iowa Press” program which will air at 7:30 p.m. tonight, Jindal said those kind of “hypothetical games about foreign policy” aren’t productive. According to Jindal, it is “important to remember” that at the time President Bush decided to go to war in Iraq, Saddam Hussein was a “menace to his neighbors” who had used chemical weapons on his own citizens and who was blocking United Nations weapons inspections. “The problems we face in Iraq today I don’t think were because of President Bush’s strength, but rather have come about because of President Obama’s weakness,” Jindal said. Jindal addressed a wide range of topics in the interview, from the controversial ‘common core” educational standards to his support of the federal death penalty for crimes like the Boston Marathon bombing. 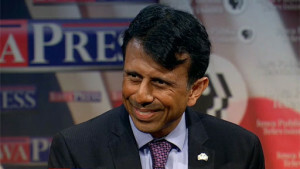 Jindal is one of the 11 candidates who will speak Saturday at the Iowa Republican Party’s Lincoln Dinner in Des Moines.